The prolife ration of apartment buildings is a defining characteristic of the 1920s growth of Tulsa. During this time in central Tulsa, numerous free-standing apartment buildings were constructed to accommodate the rapidly increasing population moving to the Oil Capital for economic opportunity. By the mid-1920s, some apartments were being built in the suburban neighborhoods surrounding Tulsa’s central business district. Since statehood new construction in downtown Tulsa and in the first ring of suburbs had been rapid and haphazard. Office towers rose up next to modest wood-framed houses. Gasoline stations suddenly appeared in residential districts. In late 1923, the Tulsa City Commissioners adopted a zoning ordinance to help protect existing real estate developments and to guide new growth in the burgeoning city. The Belmont was constructed in a zoning district specially designated for apartments. In fact, the Belmont’s zoning district was specifically named an “Apartment” district, and it was a transition zone between the higher density “Business” district to the north and east, and the lower density “Residential” neighborhood to the southwest. The transitional “Apartment” zone where the Belmont was built, approximately ten blocks in area. In this “Apartment” zone, 25 true apartment buildings as opposed to small rooming and boarding houses, were constructed in brick or with brick veneer on wood framing. Of those 25 apartment buildings, eight are extant, and of those eight, six are currently in use as apartments and two as offices. The Belmont was built near the western edge of the “Apartmnt” zone, with the zoning district’s boundary being the alley abutting the west edge of the Belmont property. As such, the Belmont seamlessly blended into the residential character of the adjacent area. 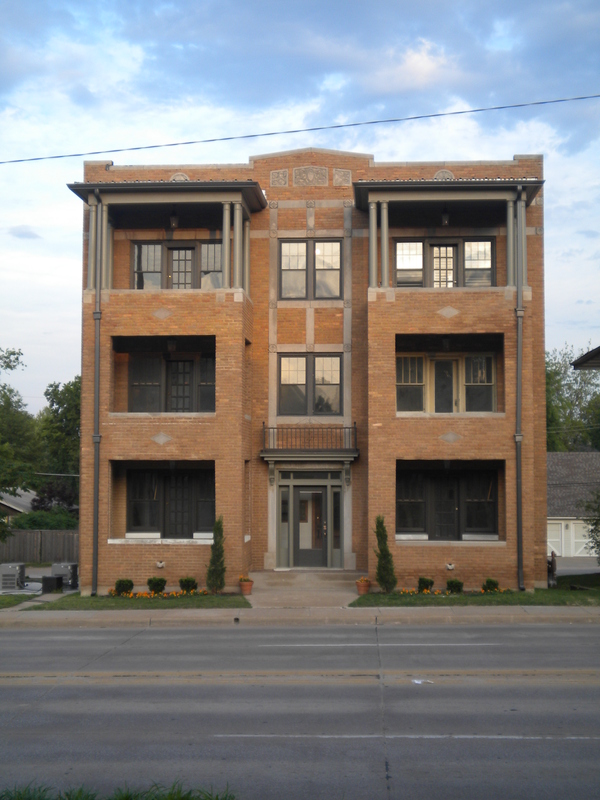 The Belmont is an excellent representation of the apartment house construction boom in Tulsa during the 1920s specifically designed for the apartment zoned area of Tulsa. This trend in apartment house construction left a permanent mark on Tulsa’s community development. Increasing more than fourfold in just a decade, the number of named apartment houses mushroomed from 78 in 1919 to 333 in 1929. Tulsa’s building boom during this period, including that of apartment houses, was related to the virtual explosion in population which nearly doubled during the 1920s to make Tulsa a major metropolitan area, as well as the thriving economy fueled largely by the oil industry. Although some large apartment houses were constructed during the period, many of the apartment buildings, like the Belmont, were modest-sized, containing from four to eight units. The Belmont Apartments was listed in the National Register on June 8, 2015. It was listed under National Register Criterion A, and its NRIS number is 15000329.